‘Beautiful yet terrifying’ seems to be the standard response from anyone who has flown into Tenzing-Hillary Airport – more commonly known as Lukla Airport. Situated on the face of a mountain at an elevation of almost 2,900m, the airport is enclosed on one end by a 600m drop off a cliff face and on the other end by a solid stone wall. Because of its precarious location and length, the airport has been rated one of the most dangerous in the world. Its danger is mainly technical in that the combination of a very short runway, extreme altitude and often adverse weather conditions make it quite a gut-wrenching ride when taking off and landing. The odds, however, are relatively good. Since inception there have only been 3 fatal crashes, all linked to bad weather. Considering that there are multiple daily flights between Kathmandu and Lukla, the numbers aren’t bad at all making the airport pretty safe. That being said, you certainly won’t be falling asleep during the short flight to the hillside runway. The small cabin, amazing vistas and precarious approach are sure to keep you on the edge of your chair – or plane seat should I say! The origins of the airport date back to the original summiteers of Everest, Sir Edmund Hillary and Tenzing Sherpa. The first runway was built by them in order to facilitate the setting up of schools in the area. Unpaved and very short, the runway could only accommodate helicopters and light aircraft, yet it provided a popular alternative to the usual 5-day hike from Kathmandu to the Everest region. It was paved in 1999, increasing its safety and allowing more aircraft to land in more weather conditions. 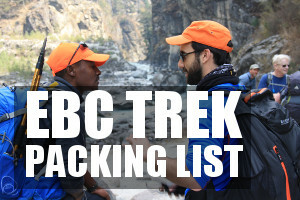 Since then it has ferried thousands and thousands of tourists to and from Lukla, most of whom will be tackling the iconic Everest Base Camp Trek with a few going on to attempt to summit Everest. Today, the airport is used every day, weather permitting. Because most of the aircraft have to be small, light and capable of performing short take-offs and landing, they typically accommodate up to 16 passengers at a time. This means each plane, of which there are many, will shuttle back and forth from Kathmandu, only stopping for as short as 90 seconds before taking off again to go fetch more travellers. Delays are very common and almost expected. Most of the flights tend to occur between the hours of 6am and 9am, when the weather is at its best. After that, rain and heavy clouds prove troublesome to the talented pilots, who have to land and take-off only using their sight and invaluable knowledge. There are no air traffic controllers or guided ascents and descents. Luckily, delays are usually temporary and sorted out within a few hours or perhaps a day. In 2011, however, the airport gained global attention when thousands of trekkers were stuck in Lukla for a week when heavy fog refused to clear up. 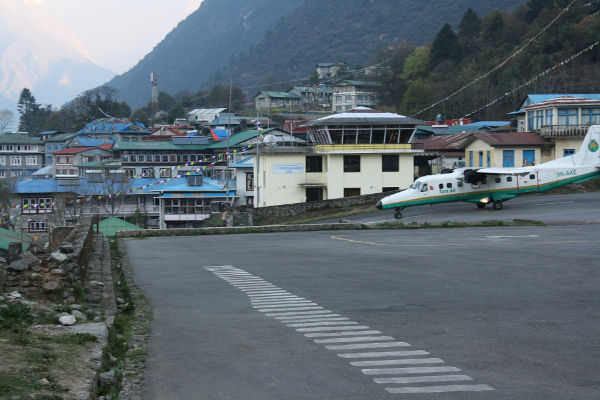 Despite a certain level of notoriety, Lukla Airport remains hugely popular and safe for the 30,000 trekkers who travel into and out of the region each year. 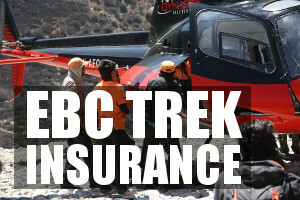 The decision between a 5-day hike to Lukla vs. a 45-minute flight seems pretty obvious to us. The views from the plane also give a nice overview of the area in which you are about to spend the next 2 weeks. The cost of a plane ticket is generally low, with most tour companies including it in their package cost. Unless you want to endure an 11-hour bus ride followed by a 5-day hike, or have enough cash to splash out on a private helicopter, then the plane ride to Lukla is a vital part of your journey to Everest Base Camp and one which you will certainly not forget! Pro Tip: If you are yet to book your ticket to Nepal, I recommend you check out some of flight aggregators, like Flight Network, to see if there are some cheap flight deals going. You won’t be able to get your domestic Lukla flights through these guys, but will be able to see international flight deals to Kathmandu!